And you thought they were just "jeans". Turns out there's more to denim than debating the relative merits of Acne vs. A.P.C. With Jeans: A Cultural History of an American Icon, James Sullivan, pop culture writer for the San Francisco Chronicle, has even managed to wring a whole book out of the topic. Among the many interesting facts it contains: Jeans were once referred to as "Fornication Pant's": Our interest piqued, we asked the author for a few other similar terms - and the story behind that unfortunate if—let's face it—totally true moniker. "Fornication Pant's": The term used by Mormon leader Brigham Young, back in the 1830s, to describe the new style of denim work pants featuring front-and-center button closures. Before this provocative innovation, men's pants fastened down the sides. "Wack Slack's" Back when there was a lot of hype around the Seattle music scene, a reporter from The New York Times called a marketing person in Seattle and asked her to describe grunge culture. The marketing person told him that grunge had its own slang and that old ripped jeans were known as 'wack slacks.' The Times printed it, not knowing that the marketing person had made it all up." Fun colors, bold patterns, feminine lines … MOSA has it all! The youngest designers in catwalk history launched their new clothing line this month. Breegan Heuer - 20 and Jessica Jordan - 19 created MOSA Clothing to add color and optimism to the fashion industry. Young entrepreneurs hitting the fashion scene their way – we like it! To quench your fashion thirst for happy hour, mix it up with these fun and fabulous designs from Americana Couture's new Swarovski crystal studded cocktail couture collection! 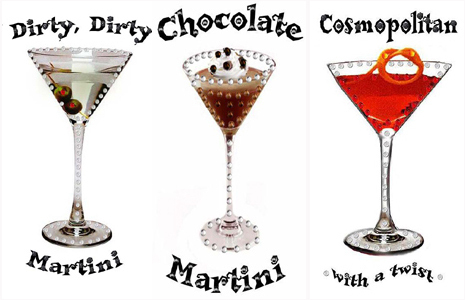 So whether you feel like having a martini or just wearing one, Americana Couture is here to help. From The Oscars® to the Grammy® Awards, Entertainment Weekly, E! Online, MTV, the WB, About.com and InStyle Magazine - Americana Couture is on the scene and coming soon to a lounge near you! Americana Couture Rocks! Jennifer Jeanne Boutique in L.A. is HOT! This ultra cool and chic boutique caters to both the two and the four legged friends! I had the opportunity to meet Julie and Jennifer of Jennifer Jeanne, and they are pretty HOT themselves. For a guy like me, HOT is HOT no matter what side of the fence one may be on. As the front window reads ... Girl ... Guy ... Doggie ... at Jennifer Jeanne Boutique. They have everything for everyone. Yes! Bootzwalla was @ Armani & Fashion Week L.A. I can prove it ... I have pictures (PG-13 & more) to show you. If Jenny McCarthy and Honey from "Queer Eye" can wear Bootzwalla, then fine ... so can you! If you loved Flashdance, you will love Bootzwalla ...leave that sweatshirt at home!... These very Barbarella inspired foot and leg wear will have you swooning for warmth ... below the knees. Lori, I adore you ... please make me a loin cloth ...or Chaps... inspired by Tarzan ... please, I beg of you!! View the collection at Bootzwalla.com. Whatever happened to simple bra names like “Cross Your Heart” or “Miracle Bra?” It must be the new breakthrough technology they used in developing this amazing bra over the past two years that caused Victoria’s Secret to give it a name like IPEX. Is it just me, or does that sound an awful lot like IMAX, as in the Theatre? What? Do you need 3-D goggles to view this bra? If you’re looking for a great pair of comfortable shoes, we know Nancy’s boots weren’t really made for walking! But if you do a lot of walking and want some shoes that will love your feet as much as your feet will love them, look no further than this fabulous brand: SOFTWALK. I recently test drove these incredibly cushioned shoes during a trip to Paris, and they were my saving grace. AMERICANA ROCKS! Not Your Average T-Shirt!